Not much to report regarding yesterday's screenings. I skipped For Your Consideration because, to be honest, I'm all movied out. But I caught Sunset Boulevard and The Godfather, both in pristine condition as I have now come to expect here. Today brings us a screening of one of Spielberg's best, and most personal films, E.T. the Extra Terrestrial. It is most emblematic of early Spielberg films tendency to look at the dynamic of broken families through the prism of science-fiction/fantasy. Other than that brief nugget one should look out for, I'm going to forgo any analysis on this one. Most everyone has seen it, and in my opinion looking at this film too closely robs it of the magic it holds for kids. Speaking of kids, tickets for this screening are half off the regular price for children under 12, a great bargain. This shall be my last entry about Robert Osborne's 2009 Classic Film Festival. It has been a joy to see these films in all of their deserved glory. I look forward to next year's slate of films. E.T. 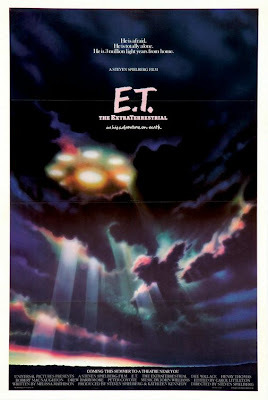 the Extra-Terrestrial screens this afternoon at 1:30 p.m. at the 5th Annual Robert Osborne's Classic Film Festival. All events take place at the Classic Center, 300 N. Thomas Street, Athens, GA 30601, (706) 208-0900 or (800) 918-6393.